Christmas on Pitcairn is celebrated by the whole community and is a wonderful occasion where families come together with friends to celebrate the birth of Christ. The Islanders are Seventh Day Adventists and as such do not celebrate Christmas as a holy festival. The only period considered holy is the weekly Sabbath. Adventists do find however, that holidays like Christmas provide good occasions to focus on the Christian aspects, that is, the biblical message of the coming to earth of Jesus, the death and resurrection at Easter, and of His incarnation. Officially then, while the Seventh Day Adventist church does not observe Christmas as a religious event, mostly because of the commercial influences on the holiday, the Adventists including the Islanders, unite to celebrate the occasion. 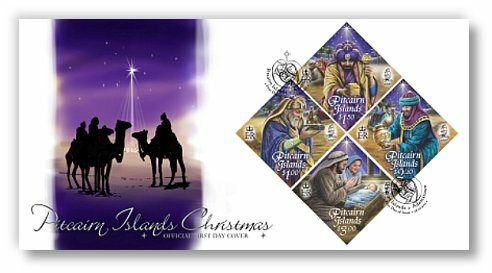 The birth of Jesus is spoken of in the Bible so individual churches worldwide have Christmas themed sermons around this time. Nativity plays are popular as they involve the younger generations and giving is a way of showing the importance of caring for others. Like most Adventists, the Pitcairners also celebrate the birth of Christ with gifts, food and community fellowship. The emphasis is on family, friendship and goodwill. The Square in Adamstown is decorated with Christmas trees and presents and everyone attends, usually late in the afternoon because of the heat. This is a time of great excitement, especially for the children with much colour and even a tropical Santa is appointed to hand out the numerous gifts of food, carvings, baskets and toys. Christmas is a special time on Pitcairn and this close community gets even closer during this happy and caring time. Merry Christmas from the Pitcairn islanders!